Both the eastern and western mountain gorilla populations are declining. As of September 2015, a consensus was conducted by the IUCN and reported numbers of the gorillas are staggeringly less than 900. The two populations of the eastern are western are geographically separated. The mountain gorilla is one of the two subspecies of the eastern gorilla. 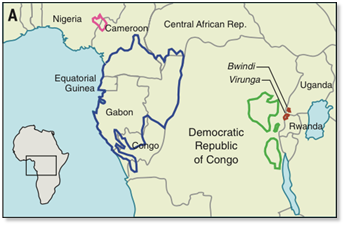 The geographical separation of the two populations occur on the African continent. One population is found in Bwindi Impenetrable National Park in Uganda. The other is scattered around parks of Uganda, Rwanda and Congo (Figure 1). The International Union for the Conservation of Nature (IUCN) have listed the mountain gorillas are critically endangered. These magnificent creatures differ from other gorillas by having thicker and longer fur. This serves them well in parts of their habitat where are weather can remain below zero degrees for weeks or months on end. These creature are primarily herbivores, where they only non-vegetable diet they have are small insects. Contrary to what people often think about the mountain gorillas, they are highly sociable species. They are very well aware of the community they are a part of. They live in relatively stable and cohesive groups held together by long-term bonds between adult males and females. The males may mate with the same female for many years and parent many offspring together. If you were to come across a mountain gorilla, the first thing that would run through your mind is that, if you upset them or if they chose to, they can seriously hurt you and even kill you, and you would be correct in thinking that! However, not surprisingly, these creature are known for their gentle approach and their shy behaviour around estranged beings they see, whether gorilla or otherwise. These gorillas, amongst other species of gorillas and apes, have a high sense of need to groom. They spend up to three hours every morning grooming one another to ‘look good’ for the day. So now that you may have a better understand of the history and background information about these marvelous specie, you'll appreciate that desperate need for us to try and preserve their habitat and try and increase their population number in the wild. 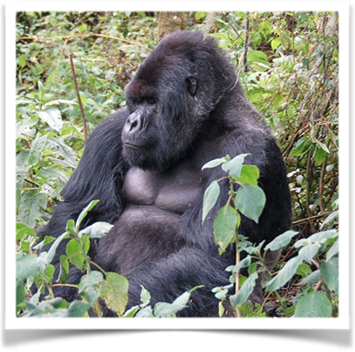 A study conducted by Xue et al in April 2015, discusses and investigates the population decline of the mountain gorilla. 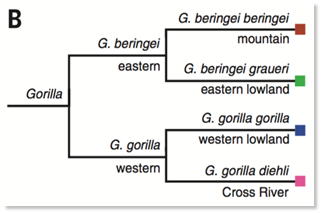 They conducted a few experiments where they sequenced they genome of a number of gorillas (Figure 2) to better understand them. Once they did the genome sequencing for both eastern and western gorillas, they compared the data to one another. By doing so, they revealed that the eastern species had a lower genetic diversity than the western gorillas. The more genetic diversity one has, the more that species has diverged and interacted with others. Therefore, this information reveals that the eastern gorillas have not been as diverse as the western species. Through other experiments on the genomes of both western and eastern species, they found that the two, used to exchange genetic material up until around 20,000 years ago. This means that although now the two species are separated and have no contact or interact with one another, they used to at some point in the past. The scientists also noted that full genetic impact of their decline is still unknown. This ultimately means that we still don't know what the effects of their population decline will have on a genetic level, and what changes this may induce in them. They also noted that the two populations have been closely inbreeding for a few decades now, which means that both population seem happy with sticking with each other and not seeking new members to join their populations. The scientist of the paper most notable repost that the decline of both populations are largely due to humans and their poaching and disruption of their habitat. Therefore, the first step towards conserving these beautiful creatures and reverse their threat of extinction, is to spread awareness of their current issue and take these fundamental steps together with the hopes of seeing their population number increase over the next 10 years.